3 WAYS TO LEARN: ONLINE, IN PERSON AND VIA HANDY HOME STUDY! For Leaders, Managers, Consultants, Facilitators, Trainers, Teachers, Coaches, Therapists, Lawyers, Accountants, Analysts and Others Who Work with Groups and Individuals. Also for Illustrators, Designers, Artists, Scribes and Other Creatives. FYI, like all of my programs, this course is a comprehensive, high-quality experience. As such, there is plenty to explain about it so you can make an informed decision about your registration. 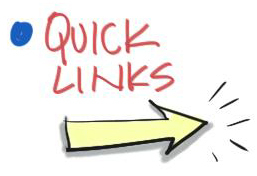 This is a thorough info page, for those who want to skip ahead, here are a list of hyperlinks so you can get to your info fast! 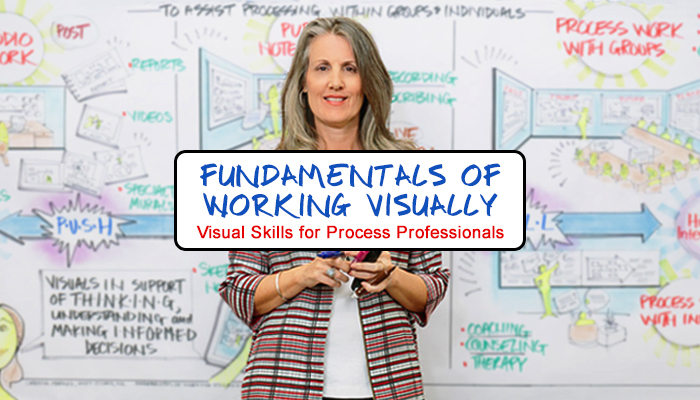 The Fundamentals of Working Visually is a comprehensive, useful, and fun training where you learn the foundational theory and skills of working visually… then roll up your sleeves and do it yourself! 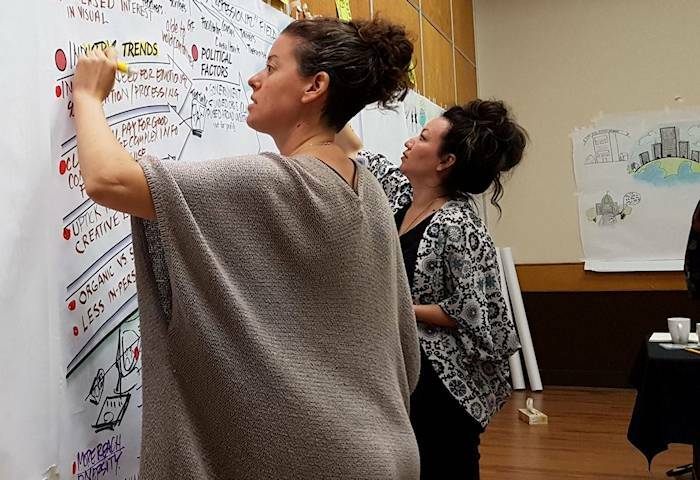 With this graphic facilitation training, you emerge with a thorough understanding of the different ways visuals can be used with groups and individuals … and are pleasantly surprised by how much YOU can apply immediately. 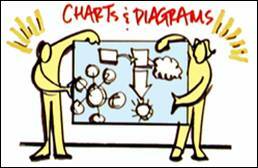 Thoroughly covers Graphic Facilitation, Graphic Coaching, Graphic Recording and Studio Work (the four main ways of working visually). Plus you meet other dedicated people doing good work in the world –– members of your global visual tribe! 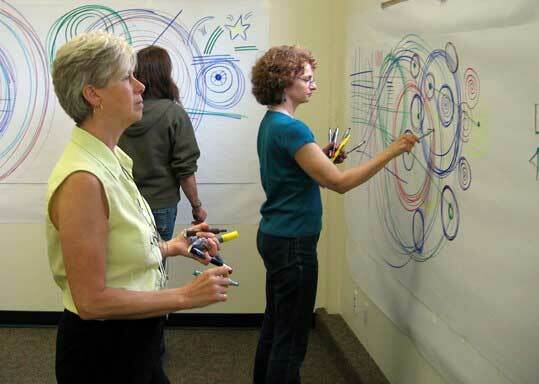 Research States That Up To 87% Of The Population Are VISUAL THINKERS. Learn To Tap The Power Of VISUAL LANGUAGE To MORE EFFECTIVELY Reach YOUR Clients! People Retain Around 65% Of What They SEE And Only 15% Of What They HEAR. The Use Of VISUAL LANGUAGE Promotes LASTING IMAGES And RETENTION Of IDEAS. 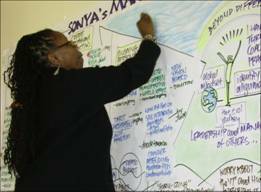 Sonya Putting Final Touches on Her Manifestation Plan. Before we discuss the workshop in depth, let me explain a bit about the term ‘Working Visually’. 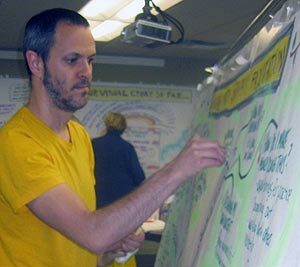 I’ve been a Visual Practitioner since 1994, and I’ve worked extensively in all four main applications: Graphic Facilitation (extracting strategic thinking and decisions from groups) and Graphic Coaching (extracting strategic thinking and decisions from individuals and partners), Graphic Recording (live visual meeting notes), and Studio Work (carefully prepared paper, digital and video materials). I just simplify it and use the term ‘Working Visually’. As the unifying factor is using visuals in process work to help groups and individuals think, communicate and collaborate. The underlying base skills are the same … just applied in different ways depending on the populations you work with and the role you provide for them. I’ve written extensively on the various applications of this work and have taught over a 2500+ Process Professionals from around the globe on how to successfully integrate these useful skills into their own toolkits. If you aren’t familiar with Working Visually (and even if you are) below are helpful resources to understand the work overall and to get a feel for my style and approach. [Video] The Four Main Ways To Do Visual Process Work: Below is an excerpt from a recent online training. Watch me explain the four main way of working visually: Studio Work (creating pre-prepared materials), Graphic Facilitation (process work with groups), Graphic Coaching/Counseling (process work with individuals) and Graphic Recording (visual summary notes of speakers, panels, etc). Additional FREE 90-Minute Info Webinar: Would you like to watch a longer introductory info webinar about this work? If so, sign up for the THREE FREE GOODIES at the top-left hand side of this site. Alternatively, you can register here. For more articles and audios, click here. 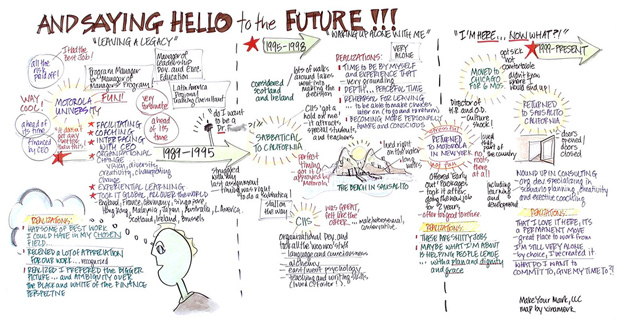 Graphic Recording (visual summary) of Conference Presentation (large view). (template courtesy of Grove Consultants) (large view). Makes You Stand Out From the Crowd (and makes sales conversations more engaging and increases client closing rates … clients literally see what they are purchasing). 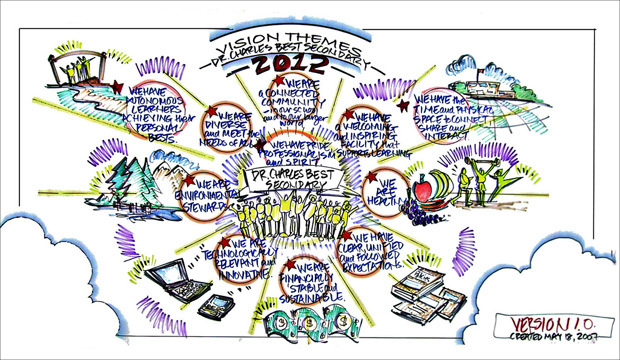 “Research has shown that visual language used in meetings shortens meeting time by 24%. 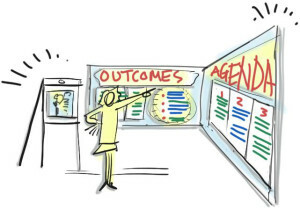 Visual language aids the decision-making process, 64% of participants made decisions after seeing visual displays”. I’ve trained over 2500+ people from across the english speaking world in working visually with groups and individuals and have personally mentored many of the prominent practitioners in this industry. 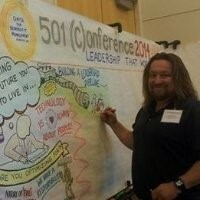 With a Masters degree in Organizational Development, I’ve been using visuals in Process Work since the 1990s when I was based in San Francisco working with David Sibbet’s The Grove Consultants International. 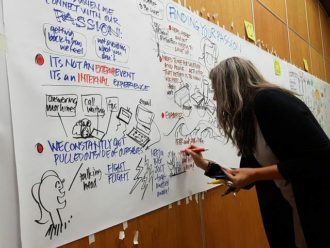 I began my career in corporate, governmental and not-for profit settings via change management and strategic planning interventions … first as a Graphic Recorder (support scribe) then eventually as a lead Graphic Facilitator (process design and facilitation). Prompted by a strong inner calling I was compelled to integrate visuals with coaching, personal development and spirituality, eventually birthing my SHIFT-IT Visual Coaching System® and helping to shepherd this specialty niche worldwide via Visual Coach Certification®. In 2009 I had a kundalini awakening which expanded my consciousness deeper into metaphysics and energy work. From beautiful Victoria, British Columbia (on the west coast of Canada) I host my SHIFT-IT School with a full curriculum of in–person and online programs that attracts people from across the globe. Feel The Markers And All The Other Creative Supplies In Your Hands … That You Now Have Free License To Play With – As Part Of Your Work! Exit With A Renewed Interest in Your Profession – Knowing You’ve Found Something That Really Suits You And The Way You Operate In The World. That You Don’t Have To Suppress Your Creative Side – There Is A Way to Enjoyably And Profitably Express It! Next Steps and Integration: Keep Your Momentum and Development Going! Plus the DELUXE VERSION of this Training Includes Three 45-Minute Private Mentoring Sessions. There are several ways you can participate in The Fundamentals of Working Visually: Online, In-Person and via a handy Home Study Kit. Also Private Training (you come to me) and In-House Trainings (I come to you) are also possible. Have Several Colleagues, Team or Department to Train? Already Have Fundamentals (Or Equivalent Experience)? Where Is The Training Held and How Do I Get There? The Online Version is a live 9-week program conducted via twice-a-week webinars (60 minutes each, plus bonus Q&A time afterwards). To participate, you require a computer with decent internet speed (ideally with an embedded or attached videocam). Plus a computer headset for audio connection (a dial-in U.S. phone number is also available). All sessions are video and mp3 recorded for easy replay (should you miss a webinar or want to re-listen). At the appointed time, you join us online via your computer to interact live with me and your course colleagues. You also receive an extensive training handbook and access to additional training videos. Plus, we also have a private online forum, which allows us to communicate between sessions (post and comment on assignments, share resources, etc). An awesome way for you to share your work, receive feedback and connect with me and your course colleagues! 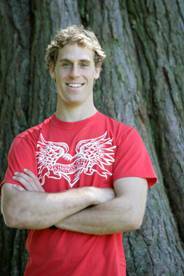 The in-person version of this workshop is held once a year in Spring in beautiful Victoria, British Columbia, Canada. Victoria is a great little city with world class amenities. Upon registration you receive the logistics for our meeting location – including travel options (ferry is one way to get here, the other is air). You are sent info on three hotels near the meeting site. Should none of these hotels strike your fancy, no problem, Victoria is a full-service tourism destination with many more to choose from. 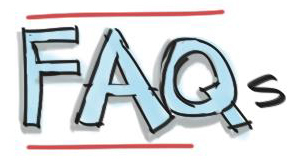 My assistant at admin@shift-it-coach.com, is available to answer your travel and accommodation questions. In the meantime, here’s Info on Travel to Victoria, B.C. For a wealth of additional info visit Tourism Victoria’s website. How Many People Are In Each Training? Who Comes | What Are Other Participants Like? Can’t Make Dates. When Do You Offer Again? What If I Already Have Experience in Visual Field? Are You Training Us On Your Visual Coaching Tools? I Can’t Attend Live, What Is Your Home Study Option? I Want Customized Training, What Can You Do? HER ENCOURAGEMENT GAVE ME THE CONFIDENCE TO FULLY STEP OUT AS A VISUAL RECORDER – NOW I HAVE SO MUCH BUSINESS I’M CRAVING TIME TO CATCH MY BREATH! 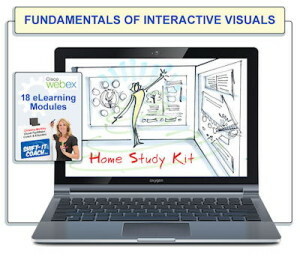 “I took the online version of Fundamentals of Interactive-Visuals, via the weekly webinars. Best 9-weeks ever spent! I am already in the Graphic Recording field but still being new to the industry, decided to register for this ‘fundamentals’ course. I learned so much in that well spent 9 weeks and it’s made my practice stronger for it, particularly in better space and role negotiations with clients, improved formatting of my wall charts and how to effectively handle World Cafe events. 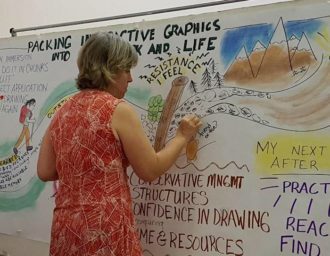 “Christina Merkley offers a number of fantastic programs (both online and in-person) for personal and professional development in and around the various fields related to Graphic Facilitation. GAVE ME THE KNOWLEDGE AND SKILLS TO PURSUE MY VISION TO OPERATE MY OWN PROCESS BUSINESS … NOW WITH ‘VISUALS’ AS A TANGIBLE TOOL TO ASSIST. 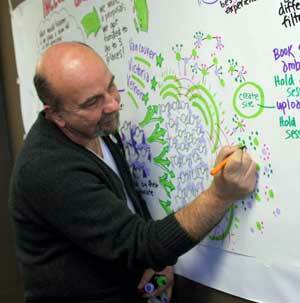 “I was introduced to the world of Graphic Recording in 2009 during a professional development seminar for teachers. I was fascinated by the increased level of engagement from participants as the use of the visual medium increased their interest and buy-in. 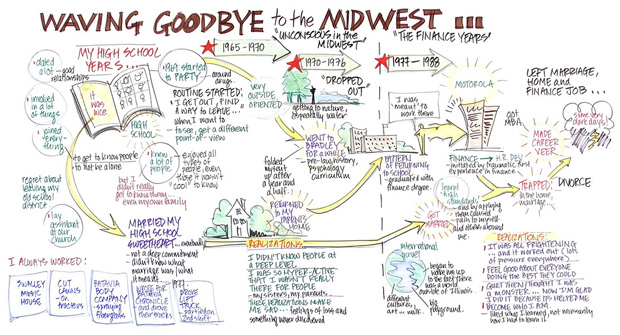 I continued to observe Graphic Recording in various venues and used a Graphic Recorder in my thesis research. 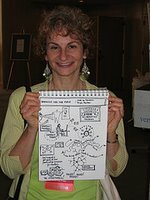 I began to seriously consider Graphic Recording \ Graphic Facilitation as a career path and was fortunate to find Christina’s Fundamentals of Working Visually. 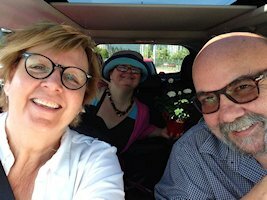 I traveled to lovely Victoria British Columbia for 3 packed days with her and a fabulous room full of diverse Process Professionals. Returning home I set up my studio and within 5 days had completed my first pro bono mural, for a local organization, which is now proudly displayed in their lobby! Fast on its heels, Christina referred a quick turnaround project from Florida. He loved his mural and I loved my first taste of providing Studio Work from a distance (was an effective and fun experience). I received my first pay cheque 2 weeks after completing the course! I definitely want to do more! I believe strongly in the power of working visually and its application is so wide ranging. I’m using charts directly in my teaching, templates to interactively engage my groups, and having a blast creating murals and visual aids (and doing Graphic Recording) for other teachers, presenters, leaders and consultants. 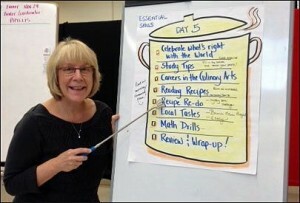 Satisfied my left brain: What the distinctions of the work are: recorder, facilitator, coach. What my strengths and weaknesses are. What my vision as a Visual Practitioner is and what I want to create for my practice here in Turkey and why. My next steps all wrapped up in a visual action plan. AN ESSENTIAL TOOL FOR FUTURE LEADERS! “One of the most important aspects of leadership is the ability to communicate. Using visuals enhances communication and therefore is an essential tool for future leaders”. 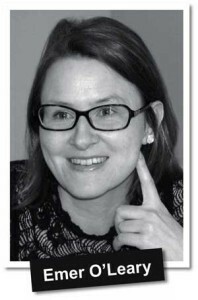 “I participated from the United Kingdom in the online version of Fundamentals of Working Visually. The course has the highest quality of materials, is professionally presented and includes a huge range of resources. 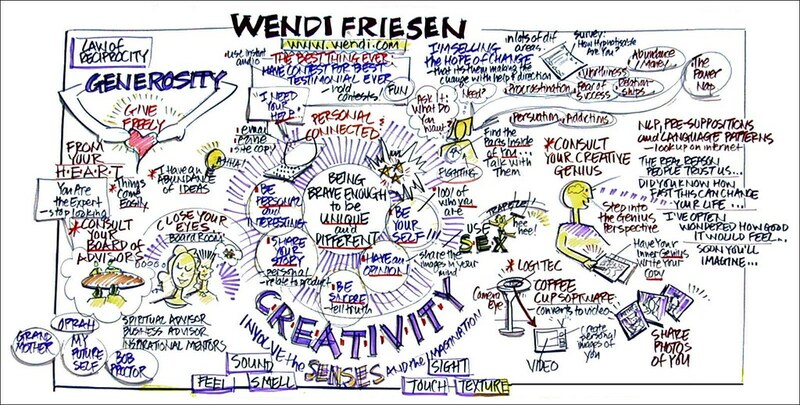 This program clarified my thoughts about which kind of interactive visuals I’m most drawn to (Graphic Facilitation and Graphic Coaching). It had lots of opportunities to practice and experiment, giving a taste test of the experiential learning I hadn’t received from previous book-based learning. “Fundamentals of Interactive-Visuals is an excellent course for Process Workers who want to integrate other modalities of learning into their work. I left with the ability to draw, create templates, and facilitate / coach in a new visual way. “Delighted I said “Yes!” to Fundamentals Interactive-Visuals. It exceeded my expectations. This online course was a whole lot of fun and nicely paced with the workbook and videos. My favorite bedtime reading for a quite a few nights plus my magic marker collection is getting a workout. THANK GOD I DIDN’T WAIT ANY LONGER! 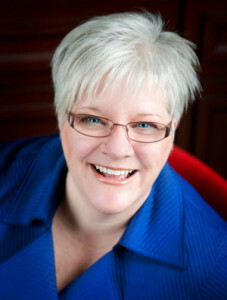 “Christina’s top-notch mentoring gave me the missing link to turn what I was doing as a hobby into an actual business. She sharpened my current skills, gave me structure and functionality (was missing as a more right-brained person) – and addressed new skills that I didn’t even know I needed! CHRISTINA’S ONLINE GRAPHIC FACILITATION TRAINING MORE THAN DELIVERED ON MY EXPECTATIONS… AND I HAD PRETTY HIGH EXPECTATIONS! 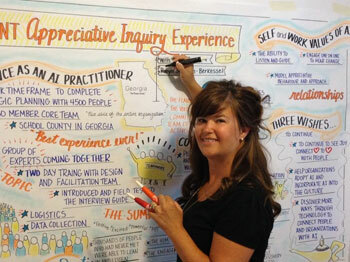 “I wanted to refresh and update my knowledge on graphic facilitation and having researched my local and online options, decided Christina Merkley was the go-to lady. Many courses offer to teach you how to doodle, very little though on how to actually support process work through the use of spontaneous or co-built visuals. Christina’s online Graphic Facilitation Training more than delivered on my expectations, and I had pretty high expectations! I loved how interactive her webinars are, especially when she demo’d things for us to better understand issues and ideas. Enjoyed seeing my colleagues from many geographies, their work and getting to interact with them. Very helpful for the sharing of ideas and experiences. After Graduation: Invite to the Working Visually eCommunity (free monthly drop-in webinars). After the in-person 3-Day Fundamentals of Working Visually I take a day off and then host my annual 3-Day Magic Marker Retreat. This Retreat is an advanced intensive for grads of my Fundamentals program (or those with demonstrated equivalent experience). It is the only in-person advanced retreat that I host each year. I intentionally run these programs back-to-back as a convenience for those traveling to train with me in person (in order to make the most out of your trip). Also good for locals who are serious about getting up to speed in a fast and fun manner. This makes for an intense week however the generated momentum and upleveling in your understanding and skills is why I continue to offer this option. My courses aren’t cheap, they are serious professional development which reap a large return on investment for those who apply what I teach. I do offer a price break for those who wish to do these two courses consecutively back-to-back in one go. 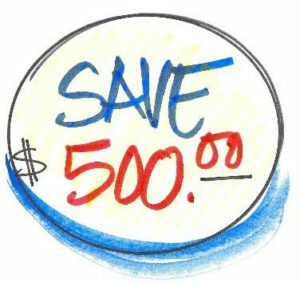 Enter the code below into the coupon code field of our secure online shopping cart at time of purchase to save $500. The cost of this workshop can be recouped quickly using your new skills. Or if you’re internal, in the satisfaction of doing your work in a whole new way that pleases you and your employer (perhaps saving them from having to bring in an external resource). 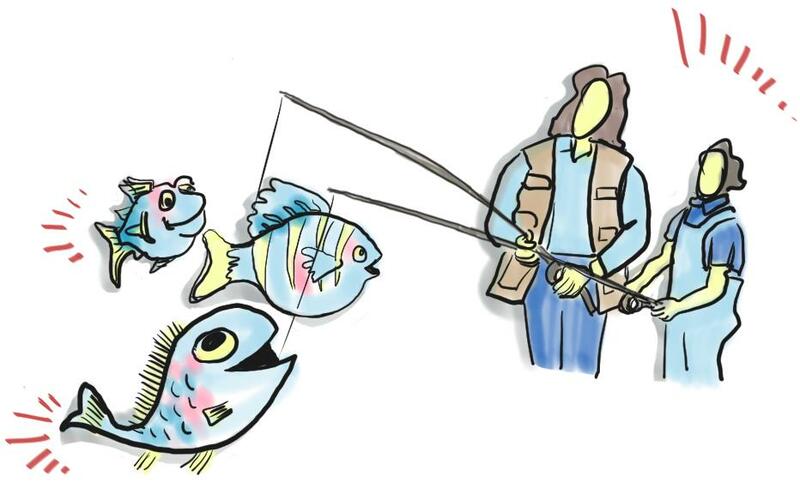 The price of this training is very fair given how you are being ‘taught to fish’ – a skill that can keep you feed, happy and intrigued for years to come (let alone all the great insights, breakthroughs and results your clients will reap). As you can read in the testimonials, some participants recoup their investment within weeks and many go on to create new careers or enhance existing ones. There are THREE LEVELS to choose from: Basic, Deluxe and Repeater. The Deluxe includes three Private Mentoring Sessions at a special rate (45-minutes each delivered by web conferencing). The Repeater is a FREE perk for those who have attended before (the live online course or have purchased the Home Study Kit). Early Bird Rates, if in effect, are listed. Several payment plan options are available. Click the links under each class for full details. Click links below to register for the upcoming training of your choice. In closing, if you are attracted to the visual way of working, I hope I have made it clear as to why this training is a smart professional investment. 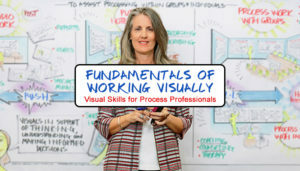 Fundamentals of Working Visually is one of the very few places IN THE WORLD where you can receive quality instruction in the full range of visual skills for use in process work with groups and individuals. I look forward to training you and introducing you to your wonderful colleagues! P.S. Further Questions? Email admin@shift-it-coach.com. You can also request a free ’30-Minute Exploratory Chat’ to chat directly with me if you’d like. P.P.S. Sometimes people are really pulled to come to this training and don’t quite understand why, as it’s an intuitive hunch not a rational decision. Like my previous attendee Val, who wrote 10 weeks afterwards to tell me she landed an Executive Director position at double her salary by using ‘visuals’ to seal the deal (she used a visual template to not only interview the Board that was interviewing her, but to engage the front line staff as well – which they loved!). She and her initially skeptical husband were very happy with her return on investment from this training and that she followed her intuition to come! “I’ve worked with Christina for several years now, using her as my personal coach and then as my trainer for the Fundamentals of Interactive-Visuals. Working in a visual way has been a dream of mine for a while, and finding Christina and her support showed me that it is possible to learn these skills despite no artistic talent at all! I was ready to incorporate the process into my work with women coping with loss and change in a bigger way this year and knew I needed some support in making it happen. I saw Christina’s notice about the Magic Marker Retreat and knew it was meant for me. YOU AREN’T FEEDING ME FISH, YOU ARE TEACHING ME TO FISH AND AS WE’VE SEEN IT’S ALREADY PAYING OFF! “Christina, I wanted to say thank you for the many valuable courses I have taken with you, and most particularly for your private coaching. You’re very welcoming, whether it’s online or in-person, with you there’s always a safe space to learn and share. Your versatility and willingness to deal with whatever is there AND what’s really there means I can bring anything to our sessions (and sometimes topics come up that I didn’t even know were on my mind) and that I trust you and your intuition to guide us wherever we need to go for best results. Though you could easily tell me what course of action I should take (and sometimes do), I appreciate how you ask me what I think I should do because it’s training me to think for myself (you’re not feeding me fish, you’re teaching me to fish) and as we’ve seen it’s already paying off! Through the depth and breadth of your experience (and products), you provide coverage across many topics: from what’s coming through me onto my wall murals to what’s coming through me into my wallet. You easily switch between inner and outer work, such that in the span of less than an hour we could do deep processing (orphan rescue, etc) as well as discuss technical / logistical topics (contracting conversations, etc). That’s key because as you’ve demonstrated time and again, doing my inner work leads to the outer “work” coming with grace and ease. “I know you realize the power of the deep spiritual nature of the work that you do- I just wanted to thank you for inspiring me over the last few months with SHIFT-IT Online and Fundamentals of Interactive-Visuals. I can’t think of any course that I have done or even taught over the last few years that had such a freeing effect on me and I wanted to let you know that I truly am grateful for your work and your gracious generosity! I learned so much on so many levels … and it continues as I refine my SHIFT-IT maps! There is something about holding space for co-creation mixed with individual creation and growth that is so powerful! I am looking at ways to build this aspect into my work – particularly with people who are labeled developmentally disabled. Often the people I work with are incredibly wise and creative- and are actually hungry for space to create without parameter. This isn’t about your curriculum per se, more about the energy and style you brought to us … so thank you for the modeling! 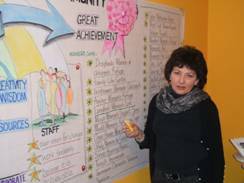 “The day I got word of my successful completion of Visual Coach Certification® I was working on a new chart for a client who comes annually for visual project updates. It’s great for them, and I love how much airplay the charts get in their work with various teams around the province. On that significant day of completion, I got to compare three charts; one from 3 years ago, another from 2 years ago and then the current one (made on the heels of the last 13 months in SHIFT-IT Online, The Fundamentals of Interactive-Visuals and Visual Coach Certification). 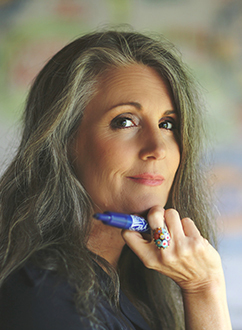 Comparing my charts was yet another powerful lesson in how good coaching can improve one’s work, and why I consider Christina Merkley one of the great mentors in my life. While that’s about the improvement of technical skills, there’s also been an amazing shift in me as a person too. I think the word that comes to mind most about this program for me is “trust.” Becoming a Visual Coach with individuals was a leap for me after years of co-facilitating groups in various kinds of team planning processes. I had worked with individuals with disabilities using the PATH Process, however I was now trusted to add the SHIFT-IT tools to my toolkit too. I made my way through the base training part of the program then progressed to working with clients: suddenly there was this one person (my first official visual coaching client); hopeful, daunted, nervous, wondering, and trusting to be coached, by me. In that moment (once I remembered to breathe) I recalled how Christina had told me the truth even when it was hard to hear, and also when she told me what she liked about what I had done and how I had improved – she asked me to try something different, in my graphics and in my life, and I trusted her sense of what I was capable of. And it worked. And she sent me back to redo something. Not many people send me back to do things over. Oddly, I liked that a lot. I LOVE GROUP FACILITATION AND AM ALWAYS RESEARCHING WAYS TO HELP GROUPS HAVE RICHER CONVERSATIONS AND ENGAGE THEM IN THE PROCESS. “I circled around Christina’s work for a couple of years before jumping in. I love group facilitation and am always researching ways to help groups have richer conversations and engage them in the process. 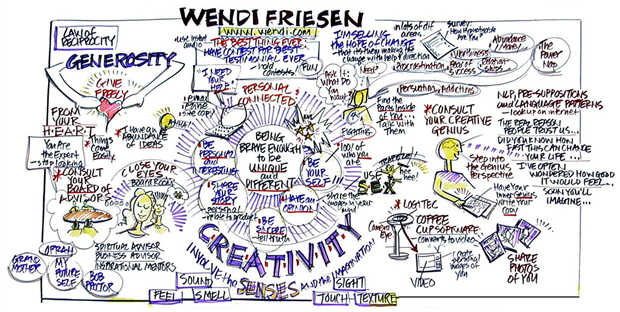 When I found her site I was just starting to understand this body of work called Graphic Facilitation and was seeking resources to develop my skills. 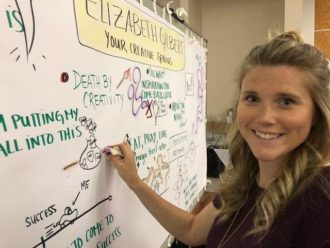 What struck me when I found her was how effectively she integrates graphic illustrations and templates as part of the group process and with coaching! I thought it was brilliant. I chose to make it all about me first so I started with The SHIFT-IT Home Study Kit. I loved how extensive and complete it was. This enabled me to work through it on my own and on my own schedule. Next I studied Business Essentials for Process Professionals, the deluxe version with the one-on-one coaching calls with her. They were awesome and helped me successfully process some dynamics occurring in my practice. Currently I’m working my way through the Fundamental of Interactive-Visuals Kit in preparation for the Magic Marker Retreat coming up in Victoria, British Columbia. I’m SO EXCITED to engage this work in person with her and the other participants! 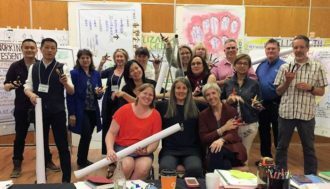 Senior Facilitator and Consultant, Facilitation Plus Inc.
CHRISTINA’S CLASSES ARE WELL PACED AND PROGRESSIVE … PROVIDE YOU WITH A SET OF PROFESSIONAL TOOLS FOR YOUR REPERTOIRE. I AM THRILLED I TOOK THE CHANCE AND REGISTERED. 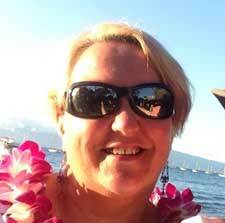 “People I respect suggested I join them for SHIFT-IT Online by Christina Merkley. 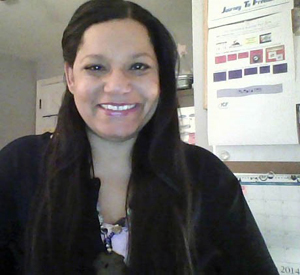 I reviewed her site and felt this program was exactly what I was looking for. 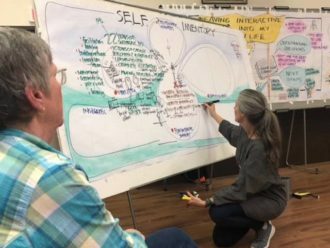 For 7 weeks, participants from all over the USA, Canada and Europe met online to explore, share, and develop plans for our own professional and personal growth – guided expertly by Christina. It was very exciting to hear others ideas and learn together. Through out my education and work career I have done various self discovery programs, but none produced the clarity and process that SHIFT-IT did. 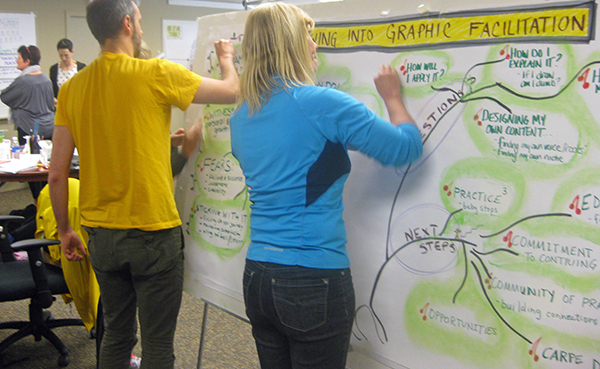 SHIFT-IT helped solidify my plan to further build my skills as a Graphic Recorder/Facilitator. So I next attended her Fundamental of Interactive-Visuals which was fabulous! 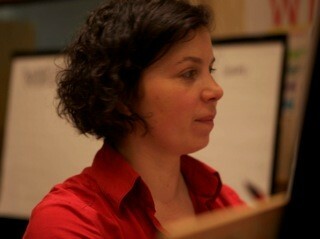 Well organized, excellent resources and Christina was incredibly supportive and encouraging. She hosts an environment that allows you to take chances while building skills and professional confidence. WE ALL HAVE GIFTS TO SHARE WITH THE WORLD. I’M GLAD CHRISTINA SHARES HERS, BECAUSE SHE IS HELPING ME TO SHARE MINE! 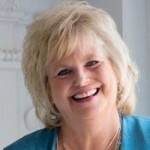 “I met Christina in fall 2012 when I joined a 12-week webinar program she co-hosted (Thrive In the Time of Awakening). 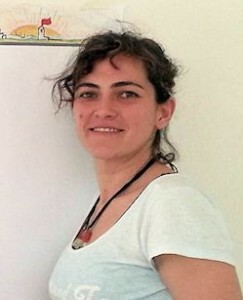 During the next months, I was simply awed by her intuitive and compassionate facilitation as participants worked through sensitive connections and integrations. Later, I followed an unlikely inner prompting (considering that I have a beloved career in accounting) and joined the spring 2013 Fundamentals of Interactive-Visuals in beautiful Victoria, BC. 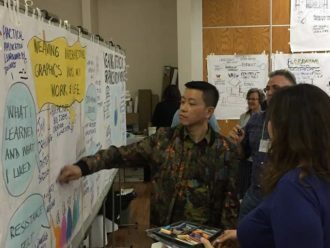 I was concerned I might feel like an outsider, but I felt welcomed in a group of graphic and process professionals as she blended detailed training with facilitation of personal expression and expansion for each of us. Most recently, I joined SHIFT-IT Online. I had been exposed to some of her visual maps in my earlier work, but this was an opportunity to dive deep. The maps helped me zero in on functional areas of my life I would like to improve without colliding with my internal resistance. And now, I am excited to venture into private coaching! 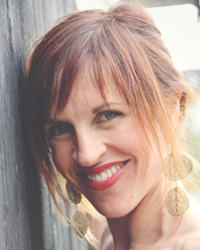 “Working with Christina Merkley has been a powerful experience! Not only is she an incredible coach, teacher and facilitator, she also has a potency and strength as a mentor that goes above and beyond. She is deeply committed to her own personal work and the well-being and happiness of her clients, colleagues and friends. And she inspires so many to follow in her footsteps towards a rich, fun and fulfilling life. I love incorporating ‘working visually’ into my healing and coaching practice. The support during her Fundamentals of Interactive-Visuals course was outstanding, helping me move through big blocks to see the goldmine that lay beneath my resistance. SHIFT-IT Online was also a great help – allowing me to further process limitations; which parlayed into one of the most successful years of my career while still being authentically and openly me. 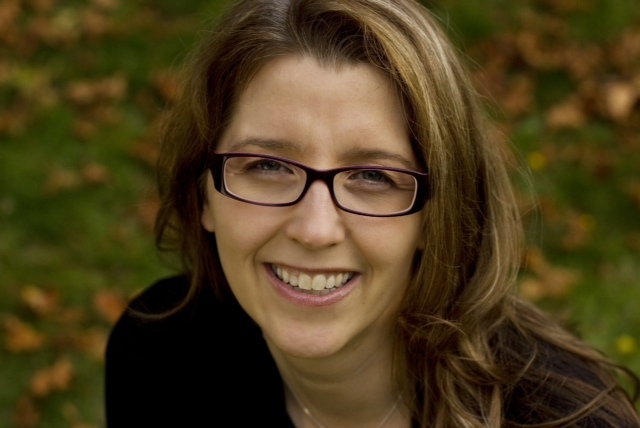 I am also blessed to work with Christina doing BodyTalk – love her powerhouse sessions that incorporate her deep wisdom, knowledge and understanding and her cut-to-the-chase coaching style and blast through stuck spots. “Fundamentals of Working Visually was inspiring, grounded and pragmatic. I really liked the format covering the main ways of working (recording, facilitation and coaching), it worked very well. And I enjoyed the demos and having lots of practice time. It’s valuable to internalize the skills and to know, from having taken this course, that with practice, I can work visually too. Initially I heard of Christina via word of mouth, but honestly, when I went to her site I was initially skeptical since it seemed heavily branded and it turned me off a bit (though I realize this is my own stuff, perhaps others feel similar). I registered anyway since I was drawn to her visual work – I found myself pleasantly surprised by her authenticity. WAS CHALLENGED TO BE BOTH CURIOUS AND BRAVE … TO JUMP IN AND MAKE MARKS, MISTAKES AND GET OVER MYSELF! 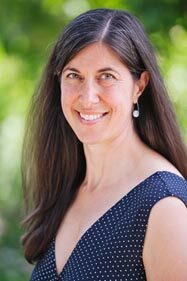 “Coming from a background in business, personal growth and healing, I resonated with Christina Merkley and her work instantly. 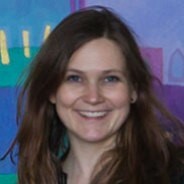 She’s professional, clear and innovative, always exploring into new process territory. I loved Fundamentals of Working Visually, it was practical skills development, creativity and self-discovery in one concise package. 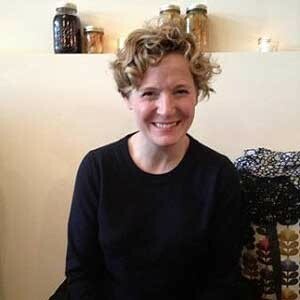 Christina is very clear, positive and holds space seamlessly, a real skill given the wonderfully wide spectrum of practitioners and interests present. I was challenged to be both curious and brave … to jump in and make marks, mistakes and get over myself (stop comparing to others and worrying about perfection). Now I can think and visualize out loud, with myself and others. It’s been really meaningful to reconnect my logical and creative sides and to spot all the applications for working visually, including mapping out processes I do regularly. 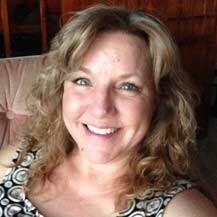 “I have been involved in adult education for 25 years as an instructor, facilitator, and in curriculum design and program development. I really enjoy learning experiences where interactive, reflective and illustration methods are incorporated. It is an ongoing goal of mine to illustrate confidently, use colour effectively, and instinctively use visual processing methods to interpret and apply information. It was for these reasons that I was drawn to Christina’s courses. I’ve taken SHIFT-IT Online, Fundamentals of Working Visually, Business Essentials for Process Professionals and, most recently, Magic Marker Retreat. I enjoyed SHIFT-IT for its comprehensive documentation and helpful templates, and loved using coloured pens and illustrations to bring clarity to the reflective exercises. Fundamentals of Working Visually was a turning point. It is a really well designed online course. 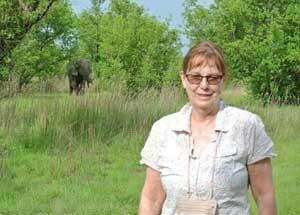 My learning was greatly enhanced through the combo of written materials, weekly lectures, Christina’s generous sharing of her knowledge and expertise, as well as the extra time to answer participants’ personal questions. Assignments were relevant, and it was fun to participate in the forum where co-learners shared projects and encouragement. I immersed myself–taking my sketch book everywhere (still do!). Business Essentials was an eye opener, especially with regards to figuring out my ideal clients, potential offerings, a company name and elevator pitch, and how to stay afloat financially. I took this course online and enjoyed taking my time to think about and refine project work. I also thoroughly enjoyed the video interviews with experts and past participants. 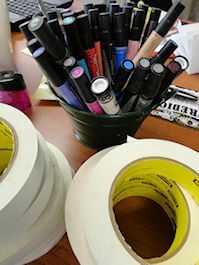 Magic Marker Retreat was a super opportunity to gather with other visual keeners in person. It was wonderful to see Christina apply her craft as she drew out classmates to shift and break through resistance. It was remarkable to see the profound insights that occurred. I have applied visual processing most notably in the planning and implementation of Instructional Skills and Facilitator Development Workshops in Ghana via a CIDA project between Vancouver Island University and a polytechnic in Sunyani. I designed a pre-workbook (with visual templates), and I also instructed trainee facilitators on how to draw icons and use headings and colour when generating purposeful feedback. Workshop participants took up their new skills with great enthusiasm and applied them really effectively to record feedback on flipcharts and chalkboards. It was also fun to watch the Ghanaian humour unfold through their icons! ONE OF THE REASONS I WAS SELECTED WAS BECAUSE DURING MY INTERVIEW I SHARED HOW I WOULD USE INTERACTIVE-VISUALS – THEY WERE REALLY INTERESTED AND EXCITED ABOUT THE IDEA! 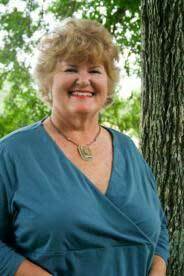 “As a CPA and Financial Coach I work with Creative and Heart Centered Business Owners using an inner and outer approach with their money and mindset. I attended Fundamentals of Interactive-Visuals last fall. Wow, I just reviewed my desired outcomes I jotted down when the course began — to be able to create coaching notes and creative worksheets for my clients – get away from the boring spreadsheets. Christina expertly provided the missing link for me. I now have the ability to create visual tools for my clients to more effectively introduce financial topics and help them see and change their complex and emotional money issues. In my private coaching with Christina we brainstormed ways to make my workshop presentations more interesting, inviting and dynamic. Next month I’m presenting at the International Coach Federation Conference. I believe one of the reasons I was selected was because during my interview I shared how I would use Interactive-Visuals – they were really interested and excited about the idea! Emboldened by success with facilitation clients, I decided to pursue using visuals with my coaching clients. While I often found myself drawing in sessions, Christina’s approach is more deliberate and intentional. I enrolled in Visual Coach Certification (which I’ll finish next month). The three coaches that I have taken through The SHIFT-IT Visual Coaching Process® were extremely positive about this inner work/outer work framework and the power of the visuals to spur deeper thinking. “Taking the Fundamentals of Working Visually was such a positive experience that FAR exceeded my expectations. The workshop was motivating, inspiring, educational and fun. Christina creates a wonderfully supportive learning environment and guides participants through a carefully crafted curriculum designed to get participants actively using visuals right way. VALUE, VALUE, VALUE … WAS SO WORTH IT! “Value, Value, Value!!! Fundamentals of Working Visually (online) was SO WORTH IT! Christina’s runs a top notch program — from the materials coming to my house prior, to the live web classes, her generous Q&A after, the class video and audio recordings, guest videos, to the private 45-minute session included. Her assistant, Patricia, is on top of everything. The cool thing was I put what I was learning into action right away in my own meetings and folks were delighted … EVEN as I was in the learner role. Did I mention FUN? That too! 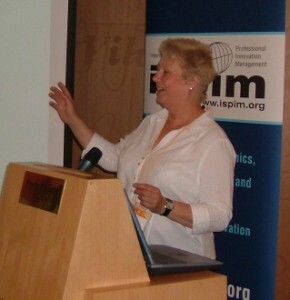 Eileen Caroscio, Coach & Presenter, Virginia, U.S.A.
P.S. 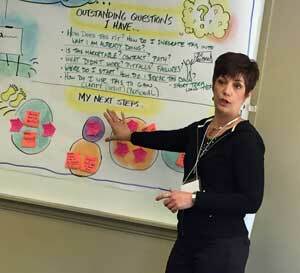 I so enjoyed my experience that I’m now in Visual Coach Certification – loving this dynamic cohort too! WONDERFUL OPPORTUNITY TO ESTABLISH STRONG RELATONSHIPS WITH COLLEAGUES FROM ACROSS THE WORLD! CAME HOME WITH A PRODUCT I CAN USE RIGHT AWAY – I’M REFERRING YOU TO MY COLLEAGUES! 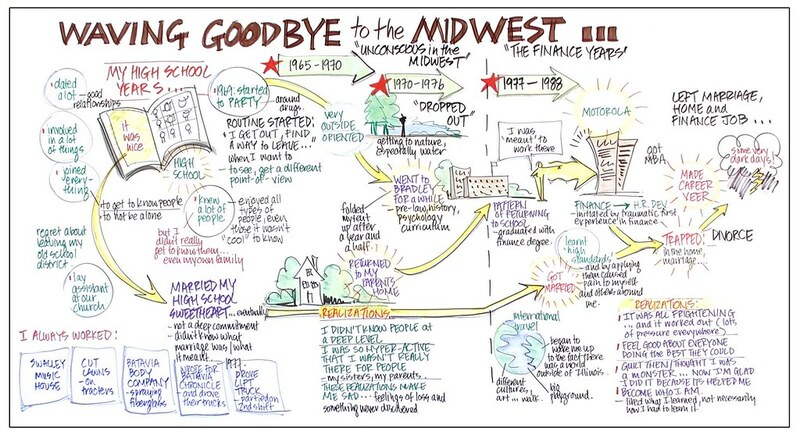 Adams & Adams Consulting Inc.
“New to visual recording, I have found that the work itself is quite profound both professionally and personally. After taking the Fundamentals of Working Visually, I took the opportunity to meet with Christina for a 1:1 coaching session. Her ability to listen and share the type of resources I needed to take my next steps has launched me into sharing new ideas at work and fulfill myself personally through further training in working visually. I’m currently taking the SHIFT-IT Online Group and short of turning into a navel-gazer, I’m discovering my true essence, what motivates me, and how I can embrace my highest potential. I look forward to experiencing what the coming weeks will bring and how I can apply my “new found self” to my existing life in new ways. 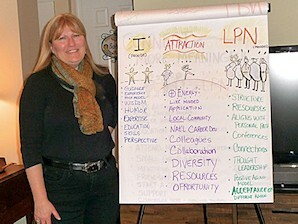 AFTER CHRISTINA’S TRAINING I IMMEDIATELY USED INTERACTIVE-VISUALS IN MY SEMINARS… AND PEOPLE LOVE IT! “Graphics have changed my life! Taking Fundamentals of Working Visually was the best professional development favor that I’ve done for myself in a LONG time. Christina is a wealth of knowledge and experience… and I especially appreciate her practicality. “Fundamentals of Working Visually! Not only did I get some amazing new skills but you also took me deeper in my personal journey …I have another community now too! 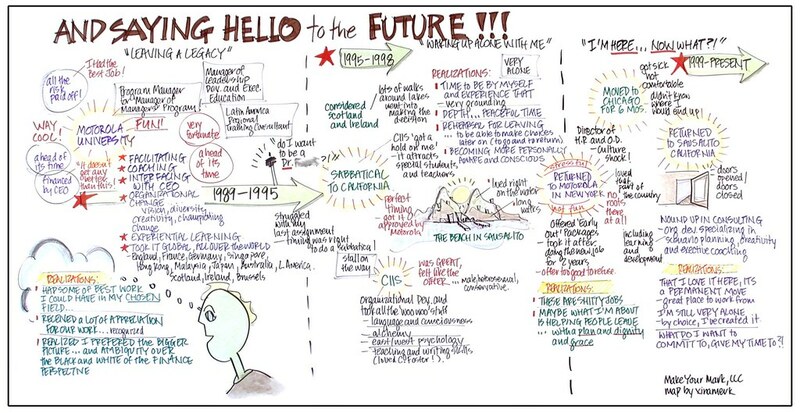 I’ve just returned from a Quality Academy for healthcare professionals that we teach – a 6-month residency program … where I did my first public Visual Recording. It was a little scary, but once I got up there, it was fine. Folks were just fascinated with it and wanted pictures because the visual recordings help them remember the content of the presentations. “I’ve worked with Christina as my mentor and guide in several capacities: Fundamentals of Working Visually, SHIFT-IT Online Group, a 6-month business incubator and now private coaching.Before her, I’d been forever scratching my head about my business and next steps. Frustrated that I couldn’t formulate my ideas well enough to get the pieces together and move forward. Never had time to flesh it out and make it real.Working with her is the best thing I have done for my business success. Guidance not only on an outward level but also the means for me to change my inner mindset … clearing the negative programming that had plagued me for so long. I’ve grown on a spiritual level as a whole person, something other business teachers/coaches have ignored. My development as a shamanic apprentice is encouraged and she’s helped me to see how to incorporate all aspects of me into what I do. GENEROUS TEACHER – SAFE AND FUN CONTAINER!